This interview is part of the Hong Kong Art History Research - Pilot Project, a collaboration between Asia Art Archive and Hong Kong Museum of Art. 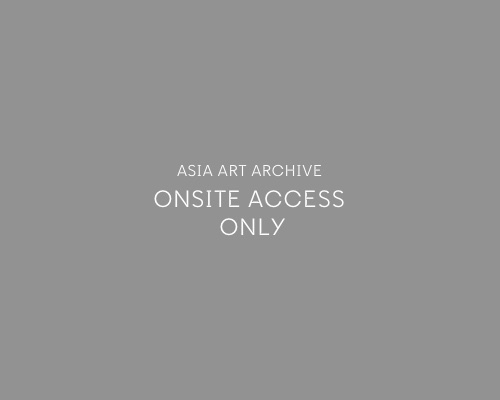 It was conducted at Asia Art Archive on 11 September 2013. Mui enrolled in the Printmaking Department of Guangzhou Academy of Fine Arts in 1959, and fled China to Hong Kong through Macau in 1963 without completing his education. Mui worked in television and film production, specifically in set design and props. He began writing extensively on art in Chinese from 1970, and was appointed the Hong Kong correspondent for the Taiwanese magazine Lion Art, writing annual reviews of artistic activities in Hong Kong. Mui’s writings have circulated widely in magazines and newspapers. His artworks have also been shown in exhibitions in Hong Kong, Taiwan, China, and South East Asia. This interview focuses on Mui as a Chinese writer who has an interest in writing about artists in Hong Kong who were less visible or have been ‘forgotten’ for different reasons. It also considers the notion of ‘leftist artists,’ and Mui’s teaching activities in the Extra Mural Studies Department of Chinese University. Mui lives and work in Guangzhou.